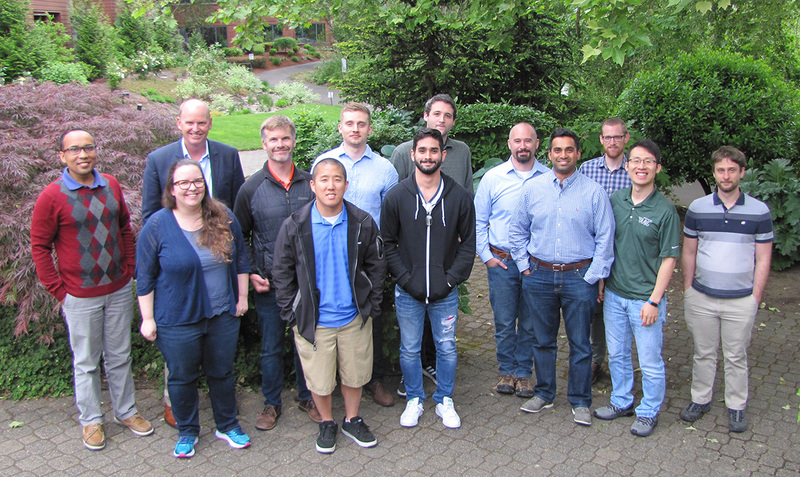 Our LS-DYNA training attendees celebrate the class with Dr. Laird in May 2018. Our LS-DYNA training attendees celebrate the class with Dr. Laird in March 2018. Our LS-DYNA training attendees celebrate the class with Dr. Laird in May 2017. 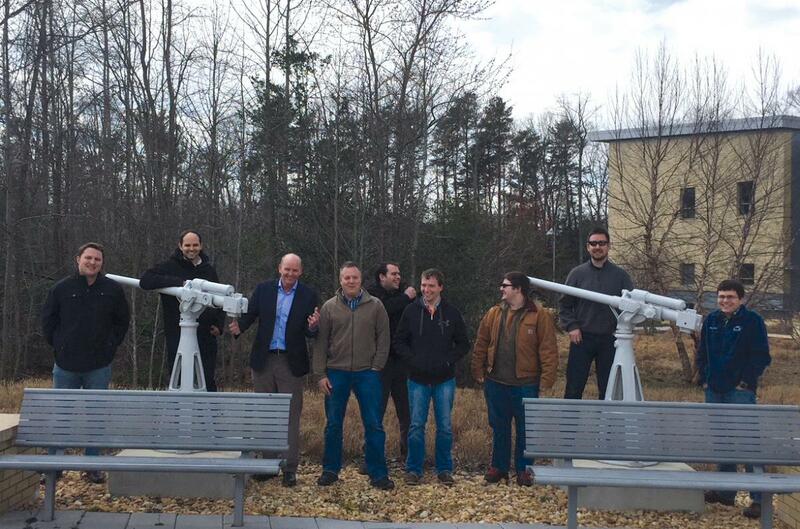 Our LS-DYNA training attendees celebrate the class with Dr. Laird in April 2016. "There is only so much you can learn in a week, having the references afterwards to look them up pays for the class." "Thanks! Awesome course, I would suggest spending more time w/ FEMAP's deck building capabilities, since that looks very appealing." "Considering the time constraints the workshops are excellent!" 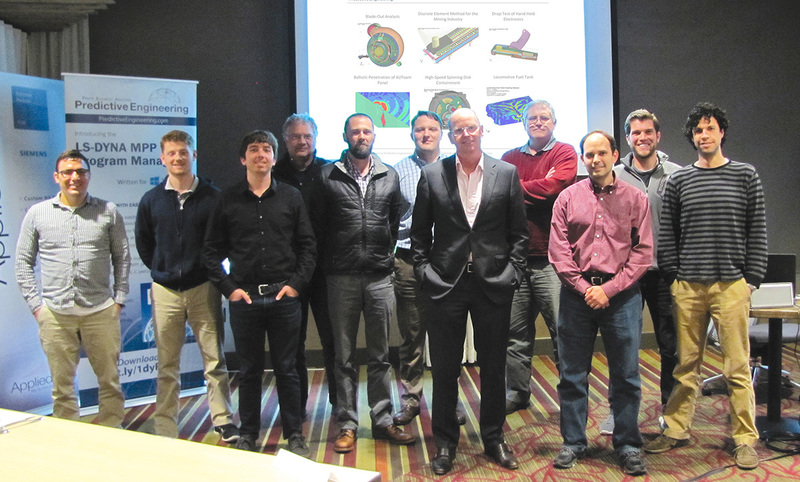 "This was a fantastic class, I feel I have the resources now to run implicit simulations. 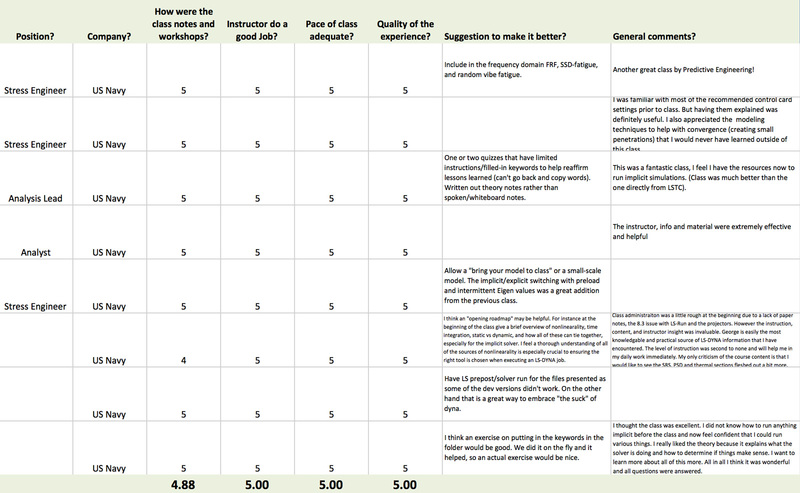 Class was much better than the one directly from LSTC." "I was familiar with most of the recommended control card settings prior to class. But having them explained was definitely useful. I also appreciated the modeling techniques to help with convergence (creating small penetrations) that I would never have learned outside of this class." 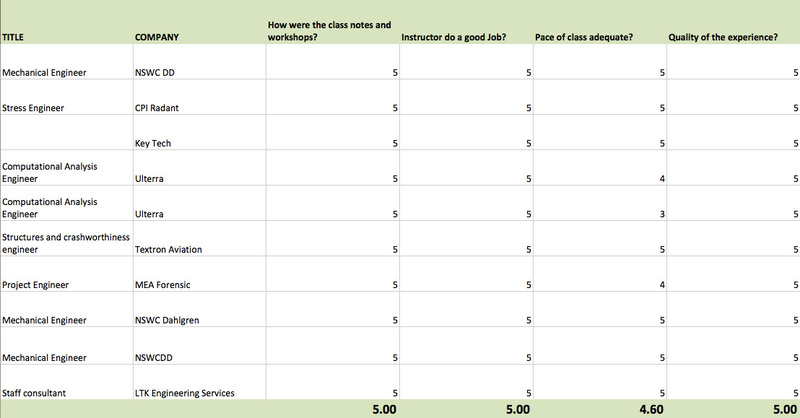 "I thought the class was excellent. I did not know how to run anything implicit before the class and now feel confident that I could run various things. I really liked the theory because it explains what the solver is doing and how to determine if things make sense. I want to learn more about all of this more. All in all I think it was wonderful and all questions were answered." "Another great class by Predictive Engineering!" "The LS-Dyna Training that Predictive offers is both comprehensive and direct. George Laird (Instructor) is obviously an experienced and knowledgeable industry expert. I finished the training with a firm grasp on the theory and use of LS-Dyna and its many quirks. I also left with an extremely valuable set of class notes, videos, and references that will help when applying what I learned to my analysis tasks. 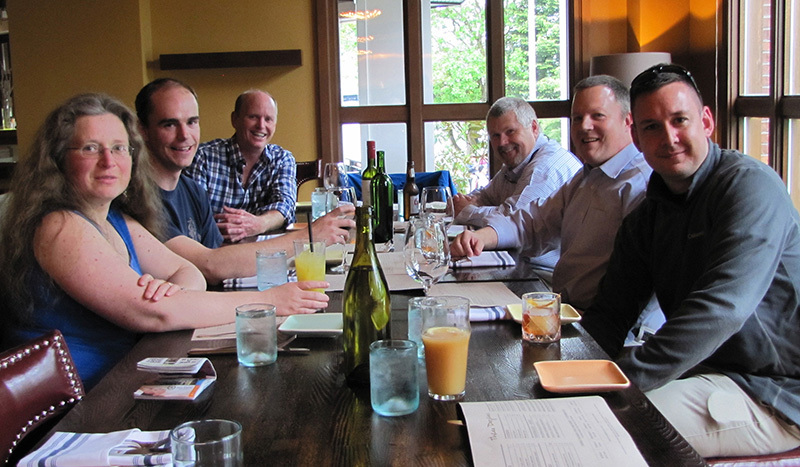 The guys at Predictive are truly top-notch and they put on a great class." "The LS-DYNA class provided by Predictive Engineering was an exceptionally well organized and methodically laid out class that optimized our learning by a healthy combination of theory, real world scenarios, and practical applications. Our group can definitely tell that Dr. Laird spent many hours organizing and creating all of the files/videos that we need so we can easily reference them years down the road. Our experience with previous instructors was that they concentrated too much on theory and not enough of actually getting problems to solve. Dr. Laird went beyond our expectations to explain to us how the structure of LS-DYNA was constructed as well as what parameters usually work for him for specific scenarios. All in all this was a great class and I would highly recommend any LS-DYNA user to attend." SCALE: "1” indicates not satisfactory, “5” indicates very satisfactory. Improve initial communicate of itinerary and agenda. Allow students to have tailored training on last day or models geared towards specific application. Course materials and digital media were worth tuition costs alone. Everything was well presented and in particular the tricks of the trade that only a long practicing simulation engineer would know. As well, the multiphysics section of the training exceeded expectations. Have gained enough understanding and confidence to undertake FSI/Multiphysics simulation upon return to office. Create section in multiphysics module for keywords typically used and recommendations, similar to section 15 and 16 in the base LS-DYNA module. This provided an excellent foundation for the development of LS-DYNA for both new and experienced users. The library of references provided will serve us very well during future model development, allowing for a consolidated set of high quality references that encompass all aspects of LS-DYNA. "[P]urchasing the right software is pretty easy but get trained to do the job at the highest possible level, this is a different story. We... started surfing through the net, looking for options. In an obviously Karmatic way, we have bumped into Predictive Engineering. I may say now that this is a milestone in the history of Doron Shalev Engineering office. I can help Webster to redefine the concept 'perfection' by describing our training under your direct personal instruction. Being so experienced in this world of various professional software, I am fully aware to the vast importance of the essential and unique little details and tips. I must thank you for loading us with a basket full of goodies toward the real life experience when on our own. The immediate successful results when using LS-DYNA for real and productive projects in the last few weeks in my office are mostly thanks to George [Laird, head instructor and company owner]. We definitely have your name and spirit on all the analyses that were performed ever since we have graduated your classes."